When you break a bone, you know it! The pain that follows a broken or fractured bone can sometimes warrant a quick trip to the closest emergency room. Sometimes, the pain could be of increasing intensity over a few days with a minor fracture. When you have a heel bone fracture, you can expect more than pain to be felt as it takes a hard force to break this bone. Learn how calcaneus fractures occur and the possible treatment options. 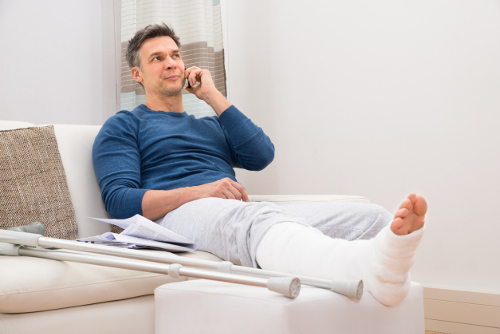 A fractured calcaneus can happen in the blink of an eye as a result of a major fall or an auto accident as the weight of the body is placed on the heel itself. Long-distance runners are at risk for a calcaneus stress fracture, which gradually worsens over time. It is thought to be the most serious of all foot injuries, because depending on the impact, the heel bone could be crushed into many pieces. 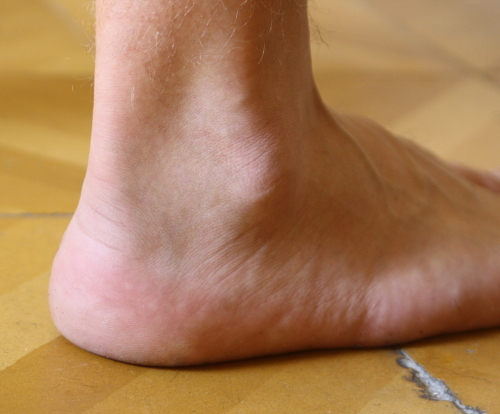 A fractured heel bone represents only two percent of all adult fractures. Here are some of the causes of a calcaneus fracture. A fall from a ladder or staircase can result in a calcaneus fracture, especially if you land on your heel sideways or firmly flat. In a head-on collision, it is common for the driver or a passenger to suffer from a broken heel upon impact. This could happen if the person braces their foot on the floorboard before the collision. It is a rare occurrence for a sudden fracture, but the impact from a contact sport can result in a heel fracture. An athlete would have to have their lower leg twist at the time they experience a direct blunt force to the heel. It is more common in long distance runners, as a calcaneus fracture can become worse with the stress of the foot hitting the ground over time. Heel fractures can happen quite easily in patients with osteoporosis disease as their bones are very fragile. We noted that a broken bone has varying degrees of accompanying pain. Calcaneus fracture symptoms may have you experiencing trouble with putting weight on the foot to walk, cause immediate swelling of the heel region, and may also result in bruising. A medical professional will give a thorough physical examination of the foot before ordering a series of imaging tests. The heel will be examined for swelling, tenderness or pain sensitivity upon touch, bleeding, any immediate discoloring, and sites of possible bone protrusion on the skin surface. Following the physical exam, you can expect to have x-rays done to determine the type of fracture and the severity. Your doctor may also want to have further testing such as a computerized tomography (CT) scan to examine the internal structure. Most cases of a fractured bone can be treated naturally without surgery, while more serious fractures do require a surgical procedure. Calcaneus fractures may be difficult to heal as the connecting joints and bones may also need to be repaired. Depending on the impact, the heel fracture may have multiple tiny fractures. A calcaneus fracture treatment may include immobilization techniques. A cast is placed to hold fractured bones in place to prevent further movement while healing naturally. The cast is created from just above the shin region to cover the lower part of the leg, heel, and foot. Depending on the patient’s health, cooperation, and severity of the fracture, a cast may be used for several weeks, if not several months. Surgery is usually the last resort, and it may be performed if the bone does not heal well, or if the fracture is severe. With this surgery, the fractured pieces of bone are reduced, realigned, and attached with metal plates and screws. This procedure uses metal screws to attach larger fractured bones. The road to recovery after a calcaneus fracture can be a long one, no matter which treatment you receive. Aside from pain-relieving treatment, there are a number of rehabilitation tasks you must follow. Calcaneus fracture recovery time varies from person to person. Once the pain subsides with immobilization treatment, it is important to perform slight motions with the foot. After surgery, it is recommended to wait until the surgical wound heals. All patients with a heel fracture will have varying forms of physical therapy. Exercises will be done at home and in a professional setting to maintain range of motion and muscle strength. Prior to rehabilitation, weight on the heel must be avoided to prevent further damage. Once the medical team is satisfied with the state of recovery, weight-bearing exercises will be encouraged. Calcaneus fractures are a critical concern, and proper treatment is necessary to ensure the bones set correctly. Depending on the cause and the severity of the fracture, treatment may include surgery. Complications from the initial fracture may even be present after treatment and rehabilitation. These can be in forms of loss of motion, pain, arthritis, and permanent disability. Cass, J., “Calcaneus (Heel Bone) Fractures,” American Academy of Orthopaedic Surgeons; http://orthoinfo.aaos.org/topic.cfm?topic=A00524, last accessed April 3, 2017. “Fractures of the Calcaneus (Heel Bone Fractures),” American College of Foot and Ankle Surgeons; https://www.foothealthfacts.org/conditions/fractures-of-the-calcaneus-(heel-bone-fractures), last accessed April 3, 2017. “Calcaneal Fracture,” Ciders-Sinai; https://www.cedars-sinai.edu/Patients/Health-Conditions/Calcaneal-Fracture.aspx, last accessed April 3, 2017. Kerkar, P., “What is Calcaneus Fracture or Broken Heel?”, ePain Assist, December 14, 2016; https://www.epainassist.com/sports-injuries/foot-and-heel-injuries/calcaneus-fracture-or-broken-heel-bone, last accessed April 3, 2017.